When you spend time fighting cancer, you really begin to realize what's important to you. The little things in life become a lot less relevant, while the major parts of your life become almost equally irrelevant unless they play a part in your survival plan. Jay Michael continues his story about living with a stage 4 cancer diagnosis. Read his previous posts in "My Choice to Live: Part I," "Part II" and "Part III." When you spend time fighting cancer, you really begin to realize what's important to you. The little things in life become a lot less relevant, while the major parts of your life become almost equally irrelevant unless they play a part in your survival plan. You remember vividly the people who stood up to your challenges and held your hand at the most difficult times, and those who could rarely be bothered to face such an inconvenience. You really begin to wonder how cancer affects other people and their loved ones. I mean, for me, this process has been one of the most unforgivably difficult challenges of my life, yet rewarding in countless ways. But the question that keeps coming up in my mind is what someone does with such a diagnosis who doesn't have the same access I've had. As a business owner, I am comfortable financially, I have the luxury of leaving work while in recovery, I have had access to many medical resources above and beyond what is typical and, frankly, I have had the wherewithal to fight and advocate for my every single move ... and that includes having to use Twitter to get the attention of some less-than-savory companies along the way. What happens to everyone else? Does it all work out the same way for them? What does the average salaried employee do? It's been something I can't seem to get off my mind, especially considering all of the challenges I have faced, both physically and emotionally, during this process and how debilitating the treatments have been. For most of my treatment so far, going to work wouldn't have been an option. From the moment you meet your oncologist, and in my case, while in a great deal of pain, your main job becomes working to identify the real problem. By the time I had met with my oncology team at Northwestern University, I knew of two large tumors (on my spine and in my kidney). Were these tumors unrelated? Were they the result of a blood cancer like lymphoma or leukemia? I literally had no idea. I found myself fighting to see anyone at Northwestern who could offer me any insight. My blood levels indicated that I may have had lymphoma, but without a PET scan and a tissue sample from a biopsy, there was really no telling what exactly was going on. My oncologist, a very personable and extremely talented lymphoma specialist named Dr. Petrich, insisted that we get a PET scan at once to determine where else, if anywhere, the cancer had spread. By this point, I had already had a renal scan and a few more detailed MRIs, all of which were pointing toward several areas infected by disease, likely cancer. Like many of us, but unfortunately not all, I have insurance through my place of employment -- nothing better or worse than the many colleagues I work with. Although I have not really needed to rely on my insurer much in the past, this was a time in my life when insurance was paramount to me getting all necessary diagnostic testing done. 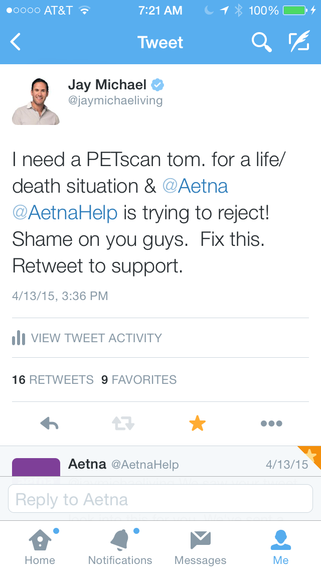 Each test until meeting the oncologist was a true battle with my insurer, Aetna. What possible motive would I have to want to spend my days not only getting unnecessary and extremely uncomfortable MRIs and scans (as well as awkward and in some cases painful tests) other than to diagnose what could be a fatal disease, which at the time was eating away at my body each and every day? While I was at the hospital speaking to specialists, I had an assistant at work fighting with Aetna to approve my necessary tests. If you were to ask her, this was a very time-consuming task, which took up the lion's share of her days. 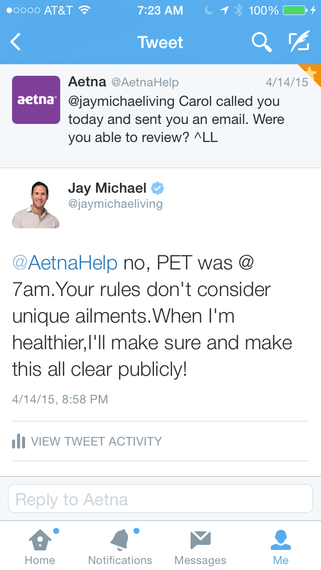 Every single exam required a fight -- at the time, we spent more time fighting with Aetna than doing anything else. But what really became the biggest challenge of all was when we learned that Aetna was unwilling to approve my badly needed PET scan. If there was one thing that I needed more than anything, it was an indicator of where the disease was in my body. Aetna held hard and fast to a policy of having a tissue biopsy before approving a PET scan, but I am sorry to say blanket policies don't fit everyone's personal medical issues. My assistant fought on my behalf endlessly, my oncology team fought with technical support, I fought and frankly it wasn't until I tweeted them that I was given any real attention from the company. All the while, the clock was ticking, and my pain was increasing to the point where walking had becoming nearly impossible. My oncology team needed the PET Scan to not only gauge where the cancer may have spread but, more importantly, to indicate where to perform a tissue biopsy. 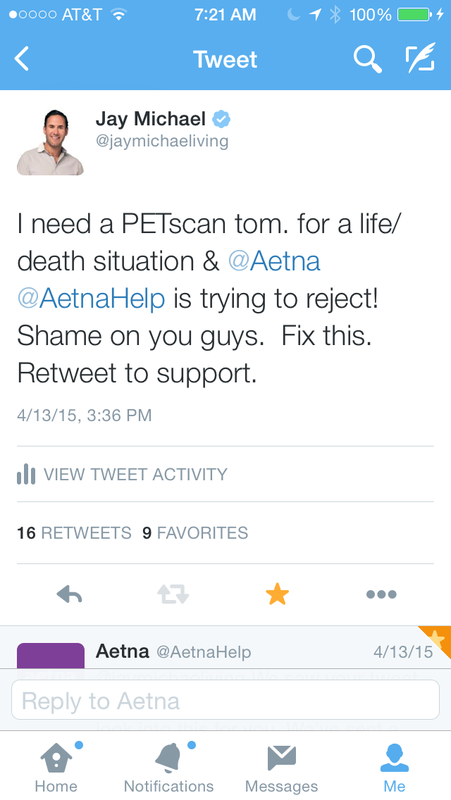 My Twitter account has about as many followers as Aetna's main account, I have more engagement than they do and my account is verified, so tweeting them about my PET scan was really the only way to get in front of them for a response. 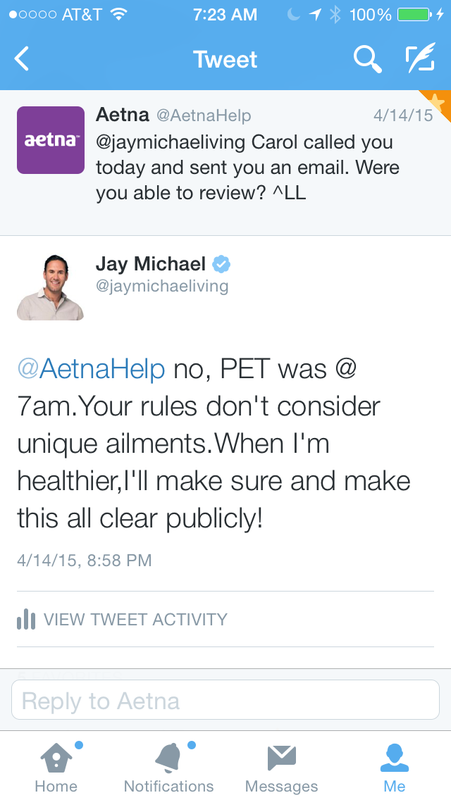 As soon as I tweeted, I was getting calls and emails from Aetna, but no one really had the authority to do much more than regurgitate the policies. It wasn't until late evening the night before the scheduled PET scan that I was able to speak to someone in leadership ... but at that point it was way too late. There was nothing they could really do. For some good Twitter housekeeping, they asked me the late morning the next day how they could help ... but it was well past the time of the 7 a.m. PET scan. Sadly, the scan was cancelled, which put me back almost a week. I learned later that each day gave the disease more time to spread. I was dying of cancer while they made me wait unnecessarily. Many doctors have told me that medicine is as much an art as it is a science -- there are no real hard and fast rules, which is why insurers like Aetna must learn to be flexible in cases such as mine. I eventually had a biopsy and then a PET scan. It took me more than a week of course, when every single moment was critical to my survival. The PET scan identified the disease to be in my spine and kidney as expected, but also on my heart, my lungs, my adrenals, my sinuses, my brain and many other places above my abdomen. Although I am thankful we made the discovery and began treatment fairly immediately, I will never forget the anguish and unnecessary pain inflicted by having to constantly fight for approval and delay the process of saving my life. It again brings me to the question of what someone else would do in my shoes. Someone without a Twitter account and without an assistant at work able to advocate on his behalf? Someone unwilling to advocate for himself with unwavering commitment, someone who wasn't going to allow himself to die. Did the fact that my PET scan indicated disease in many of my primary organs teach Aetna a lesson for cases such as mine moving forward? To think that a copay plus the amount paid by insurance is all you'll have to pay is naïve. In fact, I think the real battle is how to manage all the expectations, costs and losses amassed from suffering through a cancer diagnosis after the insurance kicks in and begins playing nice (like, actually paying medical bills without causing unnecessary headaches). In my case, the treatment covered by Northwestern, albeit a major part of my recovery process, is only one piece of the puzzle. There is diet and nutrition, time off of work -- essentially a full-time leave of absence -- consultants and meetings with alternative therapists (this was my choice, but with a stage 4 diagnosis, I think every patient should be meeting with anyone who may have some ability to help), the cost of transport and support and the most important and costly thing of all, time. Finding the time and energy to fit it all in, while being beat to a crisp by chemotherapy and medications ... it's a nearly impossible feat. Let's be frank: The actual financial costs are high. My seven rounds of inpatient treatment will cost between $210,000-$280,000. In addition to these treatments, I would say I will amass nearly $50,000-$70,000 in additional medical fees between my in-patient treatments. My insurance will pay the majority of these fees, I assume, and after this coverage all additional cost is born to me. I spend the later part of my day prepping for a healthy lunch and dinner (well, usually, but I have been known to cheat now and again) and continue on this cycle daily. Mind you, everything now costs at least double as it needs to be totally organic and as hyper-local as possible. It doesn't end there. I consult with a renowned cancer coach, Joyce O'Brien, who manages all the non-medical pieces of my recovery (dietary, emotional, etc.) at $1,700 a month. I calculate the overall cost of my treatment to be at around $60,000 after my insurance kicks in, and this does not include the opportunity cost associated with taking nearly 4 months off of work. Again, even if money was no object, which it certainly is, who has the time to go through all this monkey business each and every day? Meanwhile, this has become your full-time job and that's perhaps the biggest expense of them all. So my question remains, who can afford this? How does someone with my diagnosis -- but who doesn't have the flexibility of owning their company and being able to afford these treatments -- survive? Do they have a much lower chance of survival? Does the average person in my shoes have the same chance to live? I have spent most of my adult life developing my business. I have always felt a strong sense of accomplishment and fulfillment from my work, but now my perspective has changed dramatically. As much as I am eager to get back to working more and fighting cancer less, advocating for those with less means and access than me suffering from cancer will become and remain a major part of my life moving forward. If nothing more, it gives me one more wonderful reason to continue my fight for survival. I will live, I will never forget my journey and I will use this experience to make changes for those facing a deathly cancer after me. We all deserve the right to live. This battle will become a major part of my mission in life after cancer ... perhaps one of my cancer's greatest gift yet. Jay Michael is a Lifestyle Architect, Community Developer, Bravolebrity, World Wanderer and a newly appointed Warrior against stage 4 cancer.